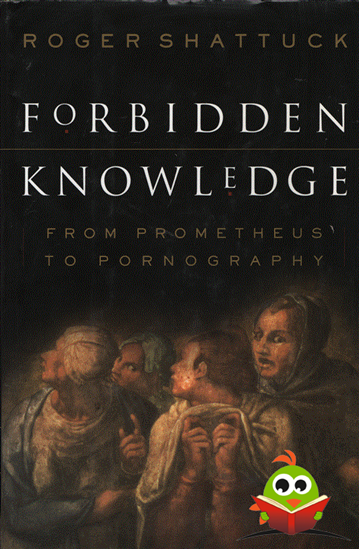 IN BOTH THE SWEEP of its subject and the vigor of its learning, Forbidden Knowledge fol-lows in the tradition of such works as James G. -a- Frazer's The Golden Bough, Joseph Campbell's and Bill Moyers' The Power of Myth, and Harold Bloom's The Western Canon. In this impassioned work, the eminent critic Roger Shattuck not only examines the meaning of moral responsibility in literature and in our everyday lives, but also suggests that we live in a violent world that dismisses taboos and fails to heed the wisdom of that which is sacred. Forbidden Knowledge boldly traces the tragic arc of Western literature and culture as it explores the notion of "forbidden knowledge," from the sexual innocence of Adam and Eve to the awe-inspiring dis-coveries of modern scientists who have created the atomic bomb and recombinant DNA. The result is a dire portrait of human presumption and of a culture that has abandoned all limits in the quest for knowl-edge and experience. The harrowing imagery that Shattuck presents is matched only by his faith that we can understand our grievous loss of innocence by reexamining our greatest myths and stories of the last two thousand years. 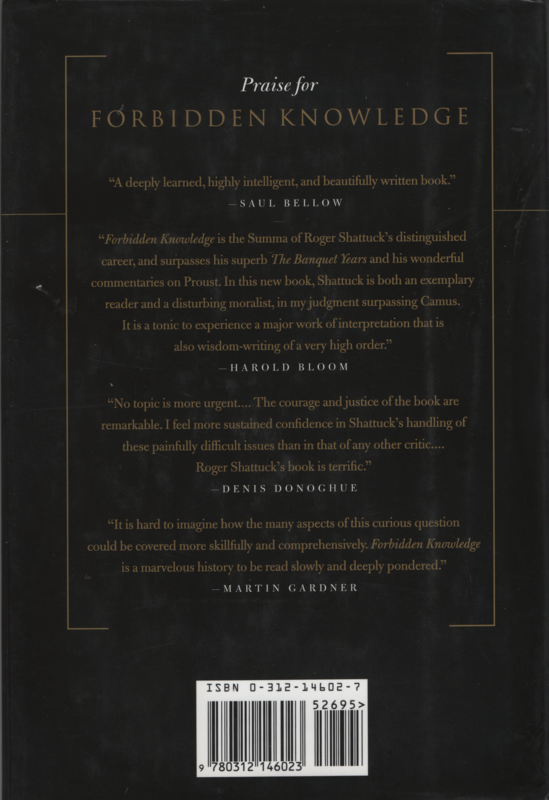 In lively, lucid prose Shattuck explores our uncertain fate through such myths as that of Prometheus and a wide range of literary works, including Milton's Paradise Lost, the writings of the Marquis de Sade, Mary Shelley's Frankenstein, Melville's Billy Budd, and the poetry of Emily Dickinson. Parents and teachers should be aware that Chapter VII does not make appropriate reading for children and minors. Hardcover. Boek oogt ongelezen. Er is niet in geschreven of gevouwen. Boekblok deels vergeeld. Stofomslag heeft doffe plekken / krasjes.